Book Six - "Book 6-23"
Jeez, I know that protecting his daughter is important, but zapping her like that… I don’t know. @Volko, Yes, I think you’re right. He clearly didn’t intend to zap her like that. The machine didn’t work like it was supposed to. I think by this time she had to much magic in her to where she started to make her own. So in trying to drain the magic he started to pull magic from her that she needed now. Yeah. That’s what I think happened too. Well, that got dark fast. Either the machine malfunctioned, or Grace’s situation was something other than Gerald had assumed. I think I know what happened, the magic in has become so well integrated into her body, that it’s fused itself into her life force. Her magic can’t be siphoned out without the machine stealing her life force energy. Sure they stopped it, but I now get the feeling that the chances of grace growing a horn to go with her wings has just gone out the window. I doubt Grace was ever going to grow a horn. The wings serve their purpose as a magical radiator adequately. A horn is meant more specifically to channel magic. Besides, it’s a lot harder to conceal a horn under your clothes. Also, a horn growing out of a human forehead looks WEIRD! 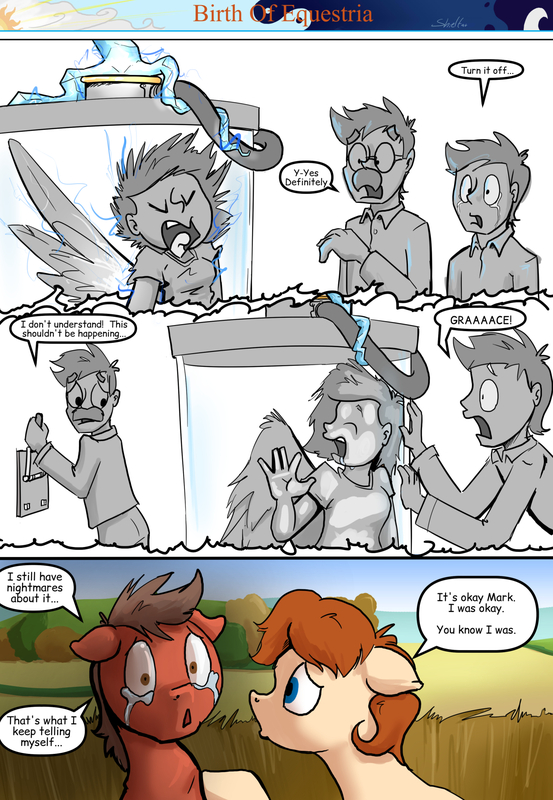 Maybe said horn would only be part of her pony anatomy, forming out of her head as she transforms into a pony like, say, her hooves or her tail? I know you’ve got a degree in MAD science, but even so, you shouldn’t put your daughter in the machine that removes a part of her without testing it on something else first.